US, 2015, 110 minutes, Colour. Blake Lively, Michiel Huisman, Harrison Ford, Ellen Burstyn, Kathy Baker, and, narrator: Hugh Ross. It would have been more cumbersome, but The Agelessness of Adaline would have been a more accurate title. There is always something intriguing about people who have the gift of longevity, agelessnessness, never changing, life for years and years – it is intriguing with vampires, but more attractive in a romantic setting. 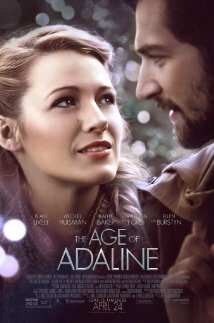 The film opens on New Year’s Eve, 2014, and a young woman called Jenny is celebrating the eve of her birthday, the film goes into flashback, to the early part of the 20th century in San Francisco, where Adaline’s parents lived. Jenny is in fact Adaline who has spent decades assuming new identities, escaping before she is found out, and coping with remaining at the age of 29 forever. Adaline has a job with the library which is digitising old film. She readily agrees to process the film and takes the advantage of looking at it, San Francisco at the time of the earthquake, her mother and father marrying in the Cathedral, her being born in 1908 and growing up, falling in love, her husband intrigued by astronomy, but dying suddenly in an accident on the Golden Gate Bridge. The voice-over gives an attempt at a scientific, physiological explanation of why Adaline becomes ageless, after a car accident, and it is be fixed in a state of never-changing physically. It may or may not hold water, but the film’s emphasis on science, love for astronomy and other sciences, benefit by having a scientific-sounding explanation. Then Ellen Burstyn appears, the actress herself being over 80 when she did this role, as Adaline’s daughter, an ageing woman, needing medical help, but devoted to her mother – sometimes a touch disconcerting when the older actress speaks of the younger actress and calls her Mama. Blake Lively is charming and a very attractive Adaline. At the New Year’s party, a young man (Michiel Huisman) puts his hand in the elevator door to stop it and talks with Adaline, attracted by her, tracking her down in her job. His wealthy and offers his books to the library. Can there be any future? Adaline has avoided this kind of a relationship for decades and refuses him only for him to persist and for her to succumb. In the second part of the film, she goes to visit the young man’s parents, played by Harrison Ford and Kathy Baker. Harrison Ford offers a winning performance, more akin to his age a character with a marriage of 40 years rather than an action adventurer. The plot becomes complicated when Harrison Ford recognises Adaline and, once again, she has to face the consequences – with some flashbacks to encountering him when he was a young student in England. Audience curiosity has been aroused as to how the film well finally work out, perhaps Adaline and the young man marrying, his knowing the truth or not. Another explanation is offered with the voice-over returning to his deadpan narration of science and physiology. One of the features of the film is to highlight how much of a single grey hair can mean an extraordinary amount in the drama. 1. A romantic film, the different eras? 2. Plausibility and implausibility of the plot, the change in Adaline? The screenplay’s scientific explanation? The first accident and the ageless situation? The second accident and the possibility of change, growing old, death? The details of the science background, for physiology and growth? The interest in science, astronomy, the stars? So many stars and their being seen as a companion for every human being? The film as a scientific? The voiceover, the tone, information, the commentary? 3. The initial period, San Francisco, Adaline’s family, San Francisco earthquake, the family wedding? The transition to 2014, New Year’s Eve, the focus on Jenny? Her age, appearance, and name, the comment about her going to change her name? Getting ready for the party, the blind friend and the piano, the presence at the party, the painter approaching, and her recognition that he was a painter? Ellis, his hand in the elevator, the comment about hands in the right place? Jenny disappearing? 4. The library, the job, the colleagues, digitising film, Jenny watching the film about San Francisco, the quake, society, the wedding, the birth, Fleming growing up? 5. Adaline marrying, love for her husband, his love of the stars, Golden Gate collapse and his death? The birth of Fleming? 6. Adaline driving, the accident, the visuals, the explanation? 7. The 21st century, the flashbacks, the policeman pulling her up, aged 45 and his disbelief? The continually escaping, secrecy, changing her name? The time in England, in Paris? The time with William, the breakdown, the battery, her driving, falling in love, the decision to leave, seeing him sitting with the ring? 8. William, his story and memories, the photo? Recognising Adaline? 9. Fleming, her age, the older actress and the younger actress for daughter and mother? Fleming’s age, in the home, her hips, wanting to move, Arizona? Adaline not wanting her to go? The lunch on New Year’s Day, happy birthday, phone calls? 10. Ellis, donating the books, arguing with Jenny, her not wanting any photos taken, the meal, her secrecy? Her decision to leave, her abrupt comments, the effect on him? Talking with Fleming, Fleming’s urging, the decision to apologise? Her taking him to the drive-in theatre and the explanations, the roof and the stars? 11. Allowing herself to love, going to his home, the sexual encounter, the relationship? 12. Ellis, his character, wealth, charity, his relationship with his parents? 13. The drive, picking up his sister, the picture of Ellis’s parents, the forty-year marriage, getting ready to receive the guests? William and his recognising Adaline, getting caught up in his memories of her? Kathy being hurt? The trivial pursuit game and her winning? The spirit of the house? 14. William seeing the injury on her arm, memories of his sewing it up, searching out the photo, confronting her? The truth? Her leaving, Ellis upset? 15. Her running away, the note, Ellis following her, the crash and the hit-run driver? The explanation of what happened to her physically, the defibrillator, the recovery? 16. Telling Ellis the truth? Fleming arriving, pretending to be the grandmother? The happy ending? 17. One year later, Fleming with the dog, staying home, going out with Ellis – and discovering her grey hair? 18. An attractive cast, and attractive story – but for Romantics?